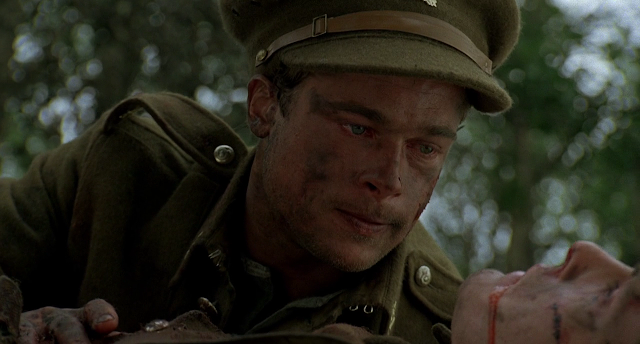 There are not enough World War I movies. 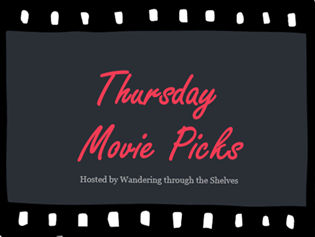 And that makes this Thursday on Wandering through the Shelves Thursday Movie Picks a tough one. I have seen even fewer, mostly because a lot of them were made in an era I haven't made my way back to. Of the ones I've seen, I would consider none of them to be favorites, though one is of the greatest masterworks of all-time (I guess?). And I hardly remember the other two beyond knowing whether I liked them or not. All three of my picks are certainly beautifully photographed. Anyway, I'm looking forward to everyone else's picks. 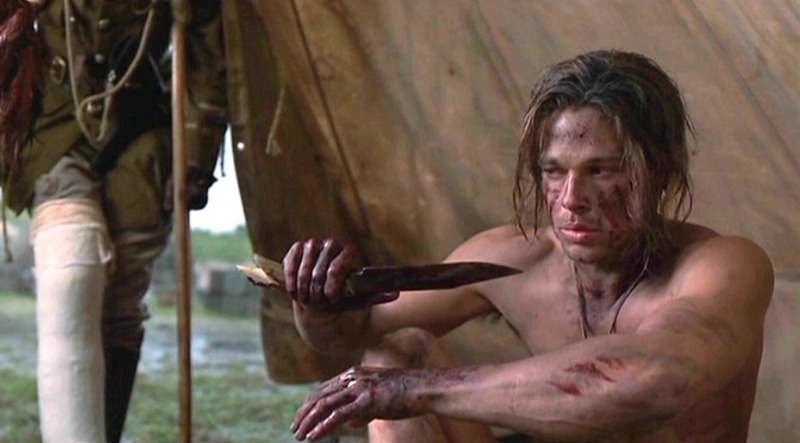 Maybe you all can tell me something good about the War that doesn't inspire that many modern movies. A four-hour long snoozefest. It took me three days to watch it, just so I could write my Blind Spot post last year. I didn't even remember it was set during WWI until I Googled WWI movies. Don't get me wrong. I appreciate its visual splendor. It's great looking. And Peter O'Toole is boss. I just don't think it's that good a movie. Probably the movie that truly moved Brad Pitt into super stardom, I remember it for its equal parts gorgeous and grim cinematography, most notably in its scenes during WWI, and Brad Pitt, of course, who owned every bit of this movie. It's a pretty simple one really. Three brothers, their father, and the woman who runs through all of them in lush, green, cold Montana. I wouldn't mind watching it again, actually. It's been years and years. The visual whimsy of Jeunet's Amelie meets the harsh dirty cold of WWI. Audrey Tatou is charming in a sad way this time. Her fiancé is supposed to be dead, but she holds out hope. There are a couple of shots in this film that I remember vividly. Cinematography game...very strong. Just a gorgeous marriage of honey gold and dirty green. Do a Google Image search. It's worth it. Apart from that...nothing. I should give this one another go as well. I remember liking it. Now, bring on Gambling (next week) and World War II (five weeks). I'm right there with you. And I am fine with you never watching Lawrence of Arabia. I would suggest watching some clips though. There are some scenes that are just glorious. Cinema at its finest. But the length of that movie is disgusting. I'm right there with you on Lawrence of Arabia! I honestly HATED it, screaming at the screen multiple times "Get Somewhere Damn It!" Visually beautiful? Yes but dull as the day is long. Conversely I love Legends of the Fall which I saw on its initial release. I've enjoyed rewatching it since but it's a movie made for the big screen. Some of the shots took your breath away and the intense emotions in the theatre setting at times were overwhelming. I've considered A Very Long Engagement a couple of times but haven't seen it yet. It is much harder to find decent WWI movies than WWII and I had to stretch one of mine, it premiered as a TV film followed by a miniscule theatrical release but the cast is A list quality. The Big Parade (1925)-A young gadabout from a wealthy family (John Gilbert) decides to enlist in WWI to experience what he thinks is the romance of war. Soon he is off to France where he befriends two other men and begins a liaison with a young mademoiselle but soon the sheen of new experiences is torn away when they discover the brutality of war first hand. One of the great silents and an essential film. My Boy Jack (2008)-17 year old Jack Kipling (Daniel Radcliffe), son of the famous poet Rudyard Kipling, wants to join the navy or perhaps the army to fight the Germans but his poor eyesight prevents his entry. Rudyard uses his influence to arrange his commission with the Irish Guards, a move Jack’s mother & sister (Kim Cattrall and Carey Mulligan) bitterly oppose because it could mean his deployment to the front lines. Jack persists and enters training, then on his 18th birthday he receives orders to lead his troops into what becomes the Battle of Loos where he goes missing. Heartbreaking illustration of the waste of war was originally a TV presentation but with that cast and level of production it could easily be a theatrical film. King and Country (1965)-During WWI an army private (Tom Courtenay) is accused of desertion during battle in Belgium. Captain Hargreaves (Dirk Bogarde) is assigned to defend him at his court-martial and though initially frustrated by the simple minded man over time he learns there is more to the case than he thought. Somber and grim but worth watching. By the way I really like the new site design! I'm so glad we see eye to eye on LofA. I was screaming the same thing. I couldn't hang onto that thing at all. I should rewatch Legends of the Fall. I haven't seen it since I was pretty young. I remember being totally captivated by it. My Boy Jack popped up on Wanderer's post. I am totally down to see anything with Daniel Radcliffe, now that I've seen him in Swiss Army Man, which is a super strange, sort of beautiful buddy comedy. Thanks so much. I feel like I needed a more classic sort of look. Legends of the Fall is so underrated. Such a great performance by Pitt and everyone involved. Definitely. Pitt was on a role with these sort of sweeping period pieces back then. A River Runs Through It is one of my all-time faves. Need to see this one again, now. I can't think of any WWI movies that I've seen. But I have Legends of the Fall (which I really want to watch), & I really want to watch Lawrence of Arabia. I can advise you that Lawrence of Arabia is long and slow and needs to be watched in pieces. Been meaning to watch Lawrence of Arabia for the longest time. They say it's a classic, but I've also heard it's hard to watch. It's only hard to watch in the sense of its four hours long. Just chunk it up. I found it boring even that way though. YES! Someone agrees with me on Lawrence of Arabia. I HATE that film! You have just made my day. Thanks! Seems like quite a few agree, which makes me happy. That movie is always so high on lists, but I just don't see it. It's pretty damn glorious at times but not enough to warrant four hours. Your welcome! I am one of your sad sacks that likes Lawrence of Arabia and finds it visually stunning, great music and a great story. I really like Legends of the Fall even though it is so very sad but still so very stunning. You are the 2nd one to pick A Very Long Engagement and I hope I get to see it one day. I don't doubt that Lawrence of Arabia has those things. I saw it and heard it, but in between the gloriousness is, to me, a great story made boring by being too damn long, even by old school intermission type movie standards. Legends of the Fall is quite devastating. I do remember that. A Very Long Engagement is a great looking movie. That's all I remember. Might be super late to the party - great new look!! Kudos for sticking LofA out, I got through 20 minutes and gave up. I know its meant to be a masterpiece and all but I really don't want to watch it. Haven't seen the other two but have heard of. I think A Very Long Engagement is one to see - mostly because its been popular this week. Thanks! I just did it the other day. You're right on time. Only 20 minutes? Dang! It's just more of the same for the other 3.5 hours. I think my other two picks are pretty safe ones. Go for it! I EFFING LOVE YOU for saying that Lawrence of Arabia isn't a great movie. LOVE YOU!!! I get flogged for saying it, but it's just so fricking bland. It's absolutely beautiful to look at...but it's literally like starring at a pretty painting for half a day...a pretty painting of the desert, for that matter. O'Toole is very good...but I never need to see that movie again...ever. And A Very Long Engagement is very good...and Cotillard is AMAZING in it! Lol. Thanks man. Love you too. It really is bland for most of the time with maybe four or five great moments sprinkled in. I won't see it again. I've done my duty. I totally forgot Cotillard was in A Very Long Engagement. I saw that Jodie Foster was in it too. I must have been stoned when I saw that movie. I was in college when I saw it, and I don't remember anything, except for a couple of really beautiful shots. I didn't remember Lawrence of Arabia was set during WWI either, but I'll have to disagree with you. I do think it's a great film. I loved everything about it, the story, the visuals, the acting, the music. I just couldn't get into it. And four hour runtimes just don't work unless you're at a theater and get an intermission. This movie just wasn't made for home viewing. I had to split it up into three parts to finish it, and I just didn't like spending that much time on a movie that didn't grab me. It does look and sound great. I can't deny that. I hear you. Plenty to admire about LofA. Not much to hold onto though. It's been so long since I've seen the others that I'm not even sure how I feel about them. Lawrence of Arabia - I feel like I've watched a long long time ago but I remember nothing. I did a blindspot list last year but didn't do write up on it. Doctor Zhivago is one that list and I still haven't seen it because it's another long one which I fear is a snoozefest too. Legends of the Fall I do remember seeing it more recently like 10 years ago, I remember nothing plotwise. Oh yeah. Zhivago. No way I'm doing that.